Background: Ensatina is a relatively common, completely terrestrial salamander of the Family Plethodontidae (Lungless Salamanders), the most diverse family of salamanders. As the name indicates, lungless salamanders do not have lungs and rely instead on the surface of their skin and buccal cavity to respire. 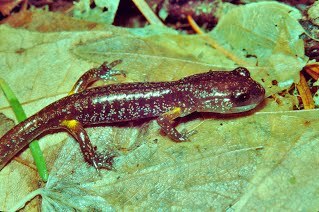 Ensatina occurs over a larger region than any other western Plethodontid salamander, from central, coastal British Columbia, Canada to northern Baja California, Mexico. In Washington, ensatina is found in forested areas mostly west of the Cascade Crest to the coast. Seven sub-species of ensatina have been designated and some are very colorfully patterned; however, in our area, the one sub-species, Oregon ensatina, is uniformly colored as an adult. 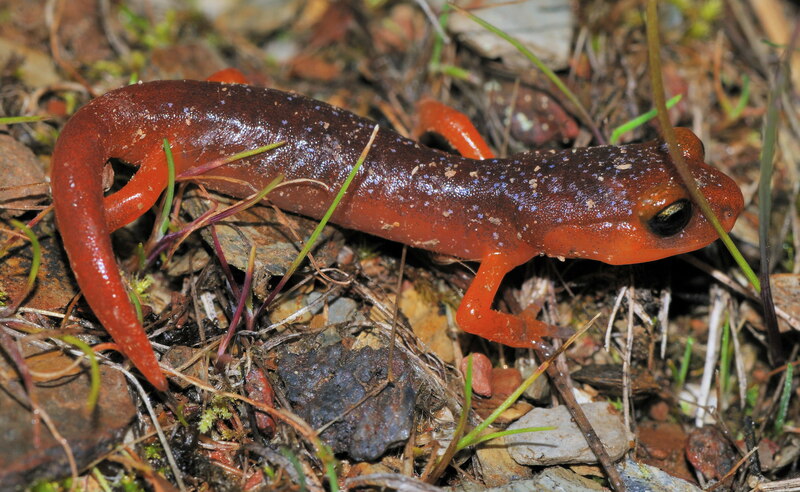 Another sub-species found in California (yellow-eyed ensatina) is regarded as a Batesian mimic of species of newt (Taricha spp. ), presumably benefiting from confusing potential predators who have learned to avoid the brightly colored, highly toxic newt. Adult and Juvenile Description: Adults of our sub-species of ensatina are medium-sized (1.5-3.2 inches [3.8-8.1 cm] snout to vent and 3-6 inches [7.5-15.5 cm] total length), robust, and relatively short bodied, with long legs. The most distinctive feature, distinguishing it from all other species in our area, is a constriction at the base of the tail, which facilitates tail autotomy, the voluntary loss of the tail when threatened by a predator. Adult coloration is light to dark brown. Juveniles are black or dark brown with small, blue or gold flecks, and have a patch of yellow or yellow-orange color on the upper surface of each leg proximal to the body. On close inspection, look for the nasolabial groove, a feature shared by all species of lungless salamanders. 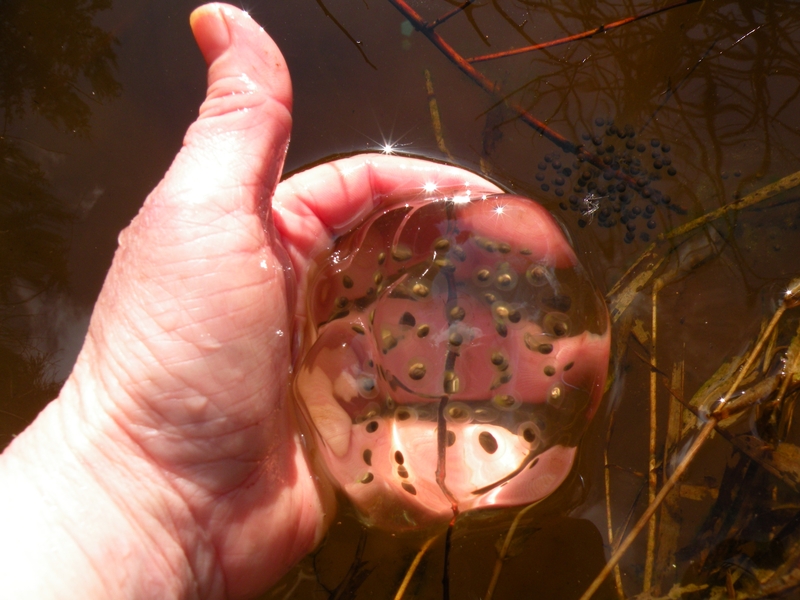 Larval Description: This completely terrestrial salamander does not have a free-living larval stage (i.e., this stage is completed within the egg and when the egg hatches, a miniature version of the adult salamander, with no gills, emerges). Egg Description: Eggs are laid in small bunches in moist, cool, underground cavities, and are rarely observed. The female attends the eggs until development is complete. Habitat: Look for ensatina in coniferous and deciduous forests (and also sometimes in clearings) in moist microhabitats, such as under rocks, logs, bark slabs, and leaf litter. Large numbers of ensatina are sometimes found associated with sloughed bark around snags. During dry seasons, these salamanders may retreat below the surface and are more difficult to find. Locations in Whatcom County: The distribution of ensatina in Whatcom County is poorly documented. Although presumably common in wooded areas below about 1,700 meters elevation, it is not known whether this species persists in areas historically cleared and where large woody debris is scarce. Juvenile yellow-eyed ensatina from Merced County, California, a form of the species that mimics newts of the genus Taricha. Our native ensatina is not as colorful.